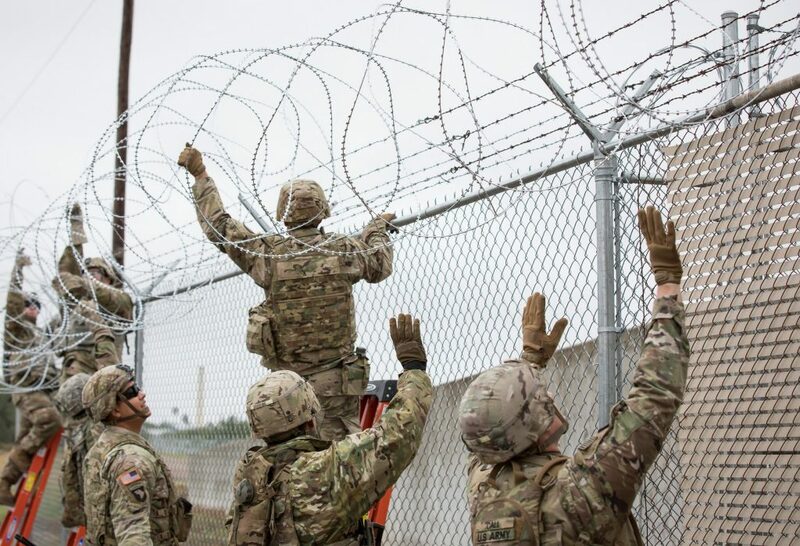 In an ongoing battle over President Trump’s border wall, the Pentagon is authorizing the transfer of $1 billion from planned military readiness projects to build fencing along the U.S.-Mexico border. Acting Defense Secretary Pat Shanahan announced the decision Monday evening. The Department of Defense (DOD) funds will now go to construction contracts. The Pentagon gave the greenlight without consulting Congress, angering Democratic lawmakers. DOD leaders are using the president’s national emergency declaration to justify the move. This comes just two weeks after Democratic and Republican senators voted against the declaration. Where will the money for the border wall come from? The funds were originally allocated for the U.S. Army and Navy. The $1 billion nearly doubles the amount Congress had authorized during last month’s budget deal. Because both the Army and Navy failed to meet their recruiting goals this year, DOD officials were able to shift money from personnel accounts that would have gone to those recruits. During a House Armed Services Committee hearing on Tuesday, lawmakers criticized this move. They said it would likely undermine military readiness. What is the Pentagon’s money going toward? The funds will build 57 miles of “pedestrian fencing” on the border. They will also pay for road construction and lighting along areas in Texas and Arizona. The DOD, however, characterized the funding shift differently in its announcement. The military is not allowed to engage in domestic law enforcement, so the DOD had to tie the funds towards a law that allows them to support other government agencies. This law permits them to construct “roads and fencing… to block drug smuggling corridors” across borders. None of the funds will go towards hiring new border agents to deal with an increase in families arriving at the border. Customs and Border Patrol (CBP) has struggled for years to fill positions along the border. Despite this, the funds won’t go to more trained personnel or better infrastructure. What are some of the risks of using this money for a border wall? The military has already experienced funding deficits in several areas this year. This has included reconstruction of military bases damaged in hurricanes, Navy ship maintenance, and operations and pay shortages for the National Guard, among others. They also stressed that efforts to modernize U.S. nuclear weaponry could fall behind other countries. Lawmakers warned DOD officials that diverting more funds could exacerbate these problems. DOD’s decision to transfer the $1 billion without consulting Congress could also cause the department to lose its ability to reprogram funds at its discretion. At the hearing, House appropriators threatened that transferring funds for the border wall could lead them to revoke DOD’s ability to use this tool in the future. Acting Defense Secretary Shanahan admitted giving up this privilege was a “downside, which will hamper us” in the future. As the risks show, the U.S. military needs to operate at full capacity. Projects like the border wall should not come at the expense of military readiness. They only weaken our security and distract from the real humanitarian concerns at the border.